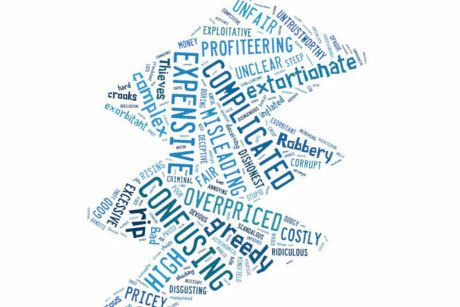 Price-conscious customers say they do not trust energy providers to offer them the cheapest price plan, with misleading tariffs still a major issue for many. An increasingly price-minded public still does not trust energy firms to offer them the cheapest price plan, new research reveals. PRWeek/OnePoll's latest survey follows last week's news that one of the big six energy firms, SSE, was fined a record £10.5m by Ofgem for mis-selling energy policies to customers. The survey showed that a pledge to offer the lowest tariff would give an energy company the biggest boost to its reputation, followed by introducing simpler bills and providing better customer service. Value for money is an increasingly important factor when attracting customers. When choosing a supplier, 79 per cent said this was a more important factor than it was five years ago, and 66 per cent said it was the only thing that mattered when selecting a supplier. More than 75 per cent said the news of SSE's fine would make them less likely to use the firm in the future. The female respondents felt more strongly about this than the males. Overall, British Gas was named the big six supplier with the best reputation. Some 20 per cent stated it had the best overall image - up four percentage points on a year ago, compared with a two percentage point drop for SSE. 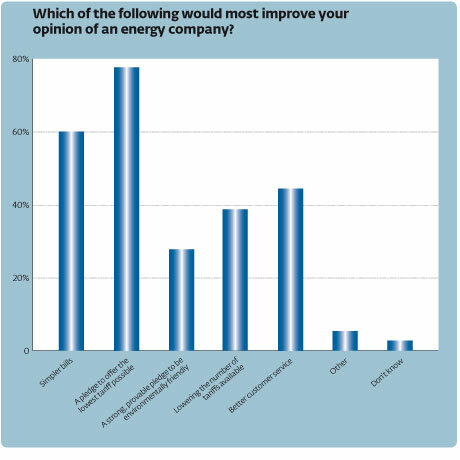 However, trust in energy firms remains very low: 62 per cent said that pricing was no clearer than a year ago, and 80 per cent did not trust the big six to sell them the cheapest deals. Two industries have had their reputations dented more than most in recent years: banking and energy. The battle for public enemy number one is a close-run thing, though on the face of it, the latter has the far bigger job. After all, energy firms provide a product consumers are aware of every minute of every day, especially so during this seemingly never-ending winter. The sector has a huge educational job on its hands to change perception and rebuild trust. Comms must play a central role in that, particularly to explain pricing and why, despite enormous profits, providers are introducing record price hikes. The fact that 77 per cent of respondents said the Government has not been strict enough on the energy companies, despite a swathe of activity over the past 12 months, should ring some alarm bells in CEO offices. With little more than two years until the next election, expect the industry to face further political interest in what is an easy win for electioneering Westminster types.